This photo was taken during an herbal walk in the forest. It was in late afternoon and the pine grove offered little lighting. I set my camera to a slow shutter speed and clicked without a flash. 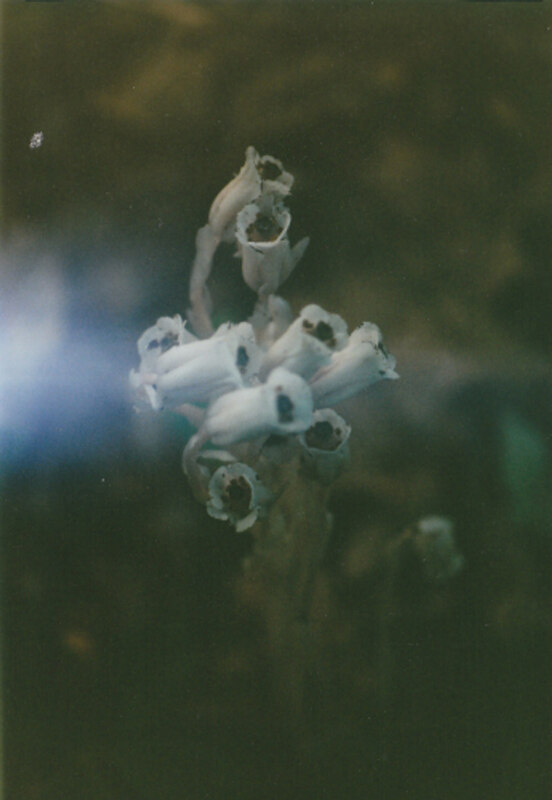 This plant is called “Indian Pipe” and it draws it’s nourishment from the mycelium network that nourishes the pine trees, as well as from the decay of rotting tree trunks and stumps. It doesn’t have chlorophyll and doesn’t photosynthesize light but somehow the light that appeared in the photo confirmed the spirit presence that was easily felt while we were quiet in the grove. There are many approaches to herbalism and all of them are an invitation to explore the magic and mystery of Nature. Each year Spring comes along and we all resurrect in some way as we witness the tapestry of Nature come to life. The quality of light becomes so clear that the sensitives can look into another world, lovers are seduced by the smells and the herbalist takes advantage of the vital medicine. Although the repetition of spring seems to be the same each year, any observer/practitioner will say that each year something new is revealed and the wisdom of Nature grows stronger. Nature’s mysteries are hidden in plain view and although plain view is ever so beautiful, inside the view is a magical realm that enriches all relationships. A simple approach to harvesting medicine. I have been an herbalist for well over thirty years. My teachers were from all walks of life and all of them strongly connected to earth wisdom. I’d have to say that our American Indians still hold the key to unlocking the medicine cabinet and they have always been generous in teaching us the many uses of the plant world. For many years I apprenticed with a Lakota Sioux medicine man and learned much about plant spirit medicine. I have developed certain sensitivities to “seeing” the medicine of a plant but not to the degree of an indigenous medicine man. What I did learn from our Native American culture is how to forage and prepare medicine. There are times when a certain medicine may enter my dream world and clearly direct me to the plants. When I am in real time and discover the family of plants from a walk in the woods, I sit with them and communicate my intentions. I rarely pick them upon the first meeting and I visit them several times as I watch for the optimum time to harvest the vital essence. I never pick endangered species and I never harvest a whole population in a given area. I always offer tobacco and prayer for permission and gratitude to pick the plant and I never have the metal of my shovel come in contact with the plant. According to the Lakota Sioux, if metal touches any part of the plant, it severs the spirit from the plant. I know this may sound irrelevant to some, but the quality of respect in approaching the natural world insures the connection to stay alive. This is the way that has been passed on to me and I’m grateful for it. Most herbalists have a unique communication with plants which over the years have cultivated remedies for every malady as well as tonics for the sustaining health. Presently I live in Scarborough, Maine, which is basically one huge marshland with a few islands of solid ground. There are many pristine areas that are great for foraging because of the numerous species of plants. I have discovered a few healthy Hawthorn trees that are a great tonic for strengthening the heart, a few choice locations for Yarrow which is a powerful remedy of athletic injuries and is often called the Arnica of the herbal world. Of course Arnica is a mountain daisy which is also a plant but because it is potentized with various dilutions it belongs in the Homeopathic realm of medicine. Dandelion and Milk Thistle is always a popular spring tonic as it de-toxifies the liver after a long winter of stagnation. I find it interesting that Dandelion is a pest to most lawns and natures way of telling us that we have toxic livers. He cure is everywhere! What came first the chicken or the egg? I wonder if our livers cleaned up to a noticeable degree, would Dandelion still be so prolific? The law of Attraction is always working! And so it goes…medicine everywhere around us and we need only to look…hocus pocus it’s all where you focus…the more you look, the more you see. The Spice Cabinet - A gourmet medicine chest. It might be fitting to talk more about our local botanical treasures but I’ll do that at a later time. Rather than reveal the secret formulas of elixirs and health tonics from what’s growing in your backyard I thought it would be appropriate to direct your attention inside of your kitchen and explore the spice cabinet. We may take it for granted that these spices have been around for as far back as you can remember, that is, your parents and grandparents used them as well as grew them in a little section called the “herb garden”. Many of these spices came from far away lands and many people died getting them here. In the mid seventeen century, wars were fought over spices from the East Indies and all hell broke loose over it. They were called the Spice Wars. Today, a few centuries later, the spices found their way into our every day meals: turmeric, curry, cloves, fennel, basil, anise, nutmeg, cumin, coriander, ginger, marjoram and many more. Many of these herbs serve not only for taste enhancement but also to help digest the food we eat. Now it’s becoming popular to have an herbal garden of Rosemary, Sage, Thyme, Peppermint, Spearmint, Chamomile, Coriander and its leafy part Cilantro. As long as these spices were on our parents and grandparents shelves very few people new about their medicinal effects. Now our spice cabinet is both culinary and medicinal and we are learning how to use them for a variety of symptoms. Let me briefly go over a few herbs that are common place in the spice cabinet. Anise ( Pimpinella anisum): this herb is often used in cough syrups as its properties make it a good expectorant. It has been used throughout China, Japan and India as a condiment and is chewed in small quantities after a meal for sweetening the breath. Anise also has a local repute as a carminative and is remembered for the treatment of flatulence. Fennel Seeds (Foeniculum vulgare): this plant is used for peptic discomforts such as mild, spastic gastrointestinal ailments, fullness, flatulence, and catarrh of the upper respiratory tract. A sweet tasting tea can be made to relieve gas, stomach ache and colic. This tea is very safe for children and good for lactating moms. The tea can also be used as an eyewash. Fenugreek (Trigonella foenum-graecum): the fenugreek seeds are commonly used in Indian cooking to stimulate the appetite and improve digestion and assimilation. It helps to stabilize the blood sugar levels and studies show that it decreases serum cholesterol levels as well. Also good for lung congestion and acts as an expectorant for mucus. Cumin (Cuminum cyminum): this plant is a traditional Indian remedy for indigestion, which is one reason why it appears in so many recipes for curry. It is a carminative, anti-spasmodic, stimulant, aphrodisiac, diuretic and it helps to flavor beans as well as antidote their possible flatulence. Coriander (Coriandrum sativum): this herb has a cooling effect on the body and is a common ingredient in Indian and Mexican spice blends to aid the digestion of hot, spicy foods. It is one of the best spices for preventing and assisting the body to get rid of intestinal worms. It is a stimulant and a carminative (helps release gas). The leaves of the coriander plant give you Cilantro which is the must ingredient for Salsa. Chewing the seeds can help to release blockage in the descending colon. Turmeric (Curcuma longa): this herb is now in high esteem in the supplement world. It is an aromatic, blood purifier, anti-oxidant, carminative, bile-stimulant, detoxifier and regenerator of liver tissue, anti-inflammatory for arthritis, skin disorders, asthma, anti-tumor activity and anti-cancer. Medicinally it is used to lower cholesterol levels and is a strong support for liver and gall bladder diseases. Good for Rheumatoid arthritis and Salmonella. It is used as a tonic for general health as it nourishes all systems. Can’t get enough of this stuff in today’s world…. Cayenne pepper (Capsicum frutescens): this plant produces natural warmth, equalizing the circulation in the aged. Stimulant and iron bearer it accelerates the oxygenation of cells. It is well respected by herbalist as the purest and safest stimulant known. It opens up every tissue in the body to and increased flow of blood. It is also an anti-septic, anti-spasmodic for relief of pain and a carminative. Curry powder: I once thought curry was a plant and found that it was compendium formula that is used in most East Indian cooking. A typical recipe of curry may consist of the following herbs: Black pepper, cayenne, cumin, coriander, fenugreek and turmeric which were individually addressed above. Marjoram (Origanum marjorana): this aromatic spice is soothing to digestion and is beneficial for colds, influenza, fever, headache, and menstrual cramps. Make a tea out of it and use for coughs and sinus infections as a steam inhalant. It is a gastro-intestinal stimulant, expectorant, diaphoretic, and diuretic, anti-viral, anti-septic mouthwash and gargle, tension headache and promotes menstrual flow suppressed by cold. P.S. you can get the following four herbs at the Scarborough Fair. Parsley ( Petroselium crispum): Eating fresh parsley stimulates the appetite and encourages optimum digestion. There’s a reason why restaurants serve it on the main course and it’s not just for decoration. Parsley antidotes the odors of garlic and onion on the breath. It is anti-microbial, anti-spasmodic, anti-rheumatic, laxative, mild brain tonic, diuretic, and gastric tonic. It’s used for retention of excess fluid in the tissues, dropsy, bladder disorders, painful urination for those who pass water after long intervals. Rich in minerals, calcium, potassium, and silica and it is said to strengthen hair, nails and skin. Sage (Salvia officinalis): Sage is singularly good for the head and brain. It quickens the senses and memory. Sage has almost been forgotten in modern medicine, but still remains in high esteem as a domestic medicine. It acts as an astringent, antiseptic, circulatory stimulant, antibacterial, antibiotic, diaphoretic. Folk medicine associates it with longevity. It’s used for sore throats, laryngitis, reduces blood sugar, and quells tonsillitis. It reduces inflammation or ulceration of the mouth, gums and throat. Respiratory allergy. Good for excessive sweating, night sweats, flatulence, loss of appetite and weak stomach. Also used for depression, vertigo and hot flushes of menopause. Rosemary (Rosmarinus officinalis): this plant is easy to grow and has a beneficial effect on the circulatory and nervous systems and used to alleviate headaches, aid indigestion and increase energy. It is an antibacterial, antidepressant, antispasmodic, diuretic and sedative. It is used in European pharmacy to strengthen the heart and allay arteriosclerosis. It relieves poor circulation and helps to strengthen the blood vessel walls. Externally it eases muscular pain, neuralgia and arthritic pain. Truly good for memory…. Thyme (Thymus vulgaris): this plant is used for infections of the respiratory organs, throat, bronchi and urinary tract. It’s a common ingredient in cough syrups and helps relieve spasms and clear congestion in the bronchial area. Thyme contains a strong antibacterial constituent, known as thymol, commonly found in mouthwashes, lozenges and liniments. Good for spasmodic dry cough, whooping cough, irritable bowel and bedwetting in children, worms and helps break the alcohol habit. Nutmeg (Myristica fragrans): is a brain stimulant, carminative, antispasmodic, sedative, diaphoretic and digestive stimulant. It’s good for children’s diarrhea, dysentery, colic, nausea, vomiting and promotes the acid content of gastric juices. May dissolve gallstones, good for nervous stomach, throbbing headache caused by stress…. Ginger (Zingiber officinalis): this plant is the only known cure for Montezuma’s revenge and diarrhea where no inflammation exists. Great for circulation when extremities are cold. Used for travel sickness and irritable bowel. Good to have a cup of ginger tea upon getting up in the morning as it clears the stomach of mucus and prepares the digestive process. It’s a circulatory stimulant, anti-emetic and a diaphoretic. Basil (Ocimum basilicum): it’s an ancient aromatic plant from the Mediterranean. It is used as the main ingredient for Pesto sauce. It is good for feelings of fullness, flatulence and stomach cramps. It’s antimicrobial, antidepressant, antispasmodic, carminative and is an adrenal stimulant. It helps to stimulate appetite and digestion and works as a diuretic. Basil helps break down tenacious oils in the body and is useful for THC poisoning. Good for stress, exhaustion and depression. Helps to prevent inflammation of stomach and intestines in cases of toxicity, allergy and infection. Borage is supportive and restorative for the adrenal glands. Cinnamon (Cinnamomum spp. ): is a stimulant astringent to the stomach. It is used for weak digestion, feeble appetite, flatulence, vomiting, hyper-acidity and promotes excretion of gastric juices. Great for irritable bowel, colds, coughs, nausea, and diarrhea. Cinnamon toasts or a cup of warming cinnamon tea tastes delicious and alleviates indigestion, nausea or diarrhea. Peppermint (Mentha x piperita): It’s a carminative, antispasmodic, digestive, anti-emetic, anesthetic, anti-inflammatory, nerve tonic, relaxant, cooling and circulatory stimulant. It is a favorite remedy for relaxing the intestinal tract and relieving gas pains. The herb is effective fro easing nausea, vomiting, heartburn, morning sickness, irritable bowel movement, colitis, Crohn’s disease and other spasmodic conditions of the bowel. It is also used for liver and gall bladder complaints, cramps of the upper GI tract and bile ducts. The oil is an often added ingredient to analgesic balms and can be applied to the forehead to relive tension and migraine headaches. Ants are repelled with peppermint, and if planted around the house, it will keep ants away. The common characteristic of the mint family is that they all have square stalks. Dill (Anethum graveolens): This herb is an aromatic, carminative, stomachic, anti-bacterial and an antispasmodic. It is used for flatulence, infant’s colic and refreshes the breath. It increases lactation for nursing mothers. Dill is used to prevent and treat diseases affecting the gastro-intestinal and urinary tract and kidneys as well as to treat sleep disorders, dyspepsia and spasms. The common denominator for all of these herbs is that they all aid in digestion. They complement foods to a cultural distinction. The more you get acquainted with their subtleties, the better cook you will become, and the more you understand their healing properties the stronger your health will become. In the herbal world, these spices represent only a small fraction of the available pharmacopoeia, but it is a good place to begin. See if you can grow them in your garden and use them when they are fresh. Herbal teachers, references, and local pharmacy. Although, I call myself an herbalist, my philosophy and knowledge is constantly shaped by my existing teachers who are Matthew Wood and Margie Flint and the influences that help them to learn as well. Matthew Wood has written a most profound book for any herbalist in practice today, no matter what level. It’s called “The Practice of Traditional Western Herbalism”and can be found at Borders, and most bookstores. Margie Flint is most local to me and she hosts a number of interesting teachers for workshops in Marblehead, Massachusetts. She also has written a book called, “the Practicing Herbalist” and can be purchased on her website at: Earthsongherbals.com Also, a good book for beginners is “Herbal Remedies for Dummies” written by Christopher Hobbs and very easy to read. “Sacred Plant Medicine” by Stephen Harrod Buhner and “Plant Spirit Medicine” by Eliot Cowan are also a good read. There truly are a number of good books out there about Herbalism, just let your intuition walk you through it and you will discover accordingly.